Build a simple report as a source for an email send. Send a Marketing Cloud–created email from within Salesforce CRM. Now that you’ve successfully set up Marketing Cloud Connect, let’s set up a quick test to ensure everything is working properly. We can build a basic email template in Marketing Cloud and then send an email to leads inside Salesforce CRM. Get started by creating a basic email template in Marketing Cloud. 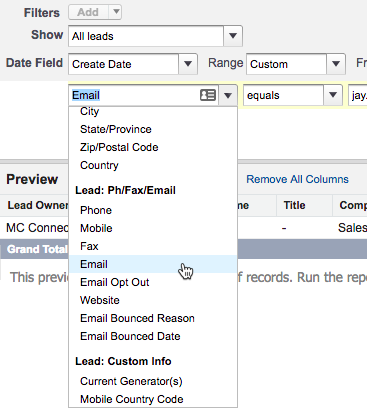 In Marketing Cloud, hover over Email Studio and select Email. Click Create and select Email from the dropdown list. Click Select Creation Option and select Text Only from the dropdown list. In the Name field, type MC Connect Test. In the Subject field, type Marketing Cloud Connect Test Email. Now that we have an email created in Marketing Cloud, we need to create recipients in the CRM environment to send our test message. In the Salesforce CRM org, select Leads in the navigation bar. Fill out First Name, Last Name, Company, and Email address with something memorable—you can use your name and company, for example. Ensure the email address you use is one that you have access to so you can view the test email. In the Salesforce CRM org, select Reports in the navigation bar. In the Select Report Type section, click Leads, then click Create. Enter id in the Quick Find text box. 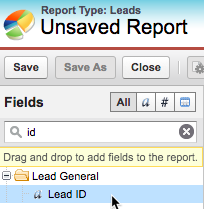 Double-click Lead ID to add it as a column in the report. In the Show picklist, select All leads. Next to Filters, click Add. A new filter appears below the Date Field. Click the down arrow and scroll down the picklist to select Email. Leave the operator as equals, and then enter the email address you specified when you created the test lead. You should see a single result: the test lead that you created. If the report looks as expected, click Save As. Name the report MC Connect Leads Test and save it in the Marketing Cloud Admin report folder. Now it’s time for the real test. Here’s how to send that Marketing Cloud–generated email from within the Salesforce CRM org. This is a real email you’re sending. Be nice and make sure you’re only sending it to yourself! Double-check the report results just prior to sending to ensure that only you receive the test message. Click Content Builder and select the MC Connect Test email template you created. Click in the Recipients section of the form. Select the Marketing Cloud Admin report folder. Select MC Connect Leads Test. In the From section of the form, select the desired value. Since this is a test email, any option is fine. Select the checkbox next to I certify all of these people have opted in (required). Voilà! The email is now queued to send. Even though the default setting is an immediate send, it can take up to an hour to see the email in your inbox. Marketing Cloud is designed for sending bulk email to potentially millions of subscribers, so there are a number of asynchronous processes and queues involved in this simple test. So be patient if the email doesn’t show up right away. When it does, if you’ve set up everything properly, the test email arrives in your inbox with the first name and last name populated, along with other details from the email send. Now that you have completed the basic configuration for Marketing Cloud Connect, it’s time to work with your users to determine how to take advantage of the new integration. What data inside the CRM system can your marketing team use to build more tightly segmented audiences? What data can they use to make emails more personalized and meaningful to recipients? It’s also worth looking through the Resources for additional content that can help you take advantage of all of the features that Marketing Cloud Connect unlocks.